Good Morning everybody. I can't believe that I'm learning so much. Only five days left and I'm so much stressful. Weather is so beautiful, but I only can watch it from my House. I can't wait to write this exams, pass them and bee free for about next four months, before going to the high school. I'm still like only dreaming about what can happen or how many people will I met. It's clearly amazing. So it's the middle of the April and the day of Vicirage's birthday is closer and closer. I'm preparing something very special for you. I can't believe that this year passed so quickly. I'm just doing what I love but never imagined that I will not give up for almost a year. This stylization, for the colder evening in my city, when the leaves turn to green and every's face is turned to smile. Pink trousers, comfy sneakers and a bit of rock star on the top. 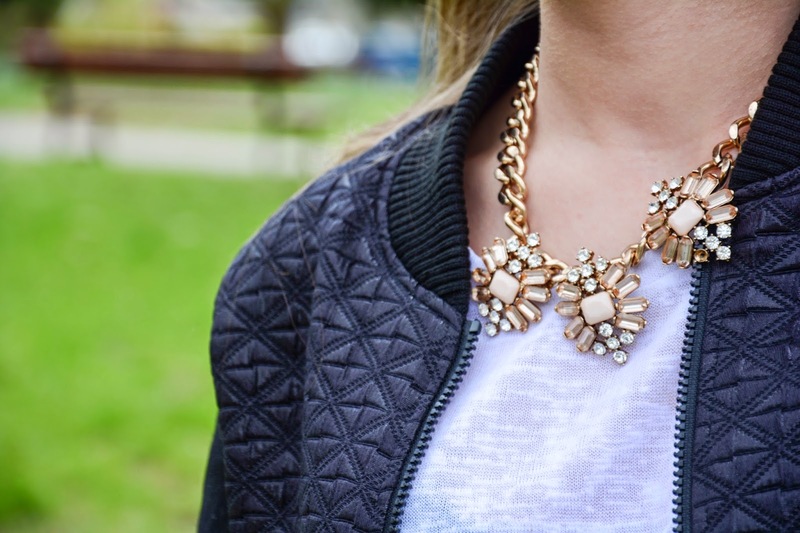 Classical white t-shirt, black, shining blazer and big, gold necklace. And this cute pink lips hahah. Okay As always I'm living to my basketball class now so have a good day peeps !